A collection of 6 watercolors in gorgeous colors and variations. 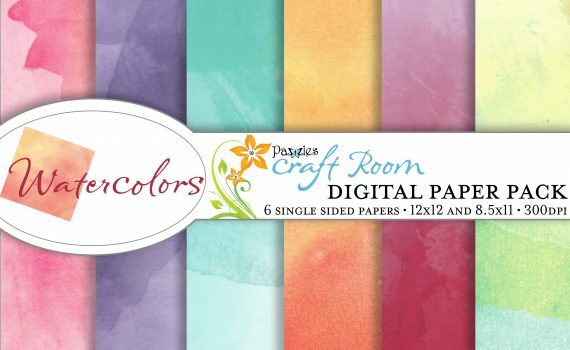 Make your next project a work of art with this digital paper pack collection! 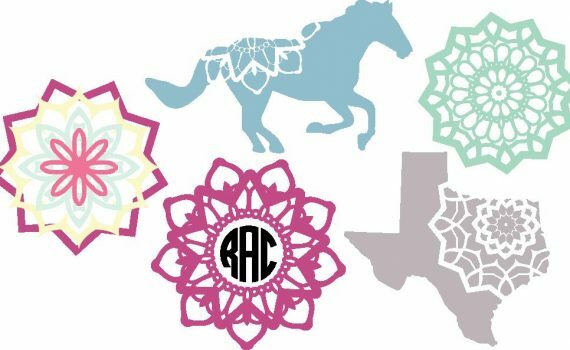 Love the intricacy and beauty of mandalas but intimidated to try making one of your own? Now with this pattern you can create hundreds of unique mandala images in seconds with just a few clicks! 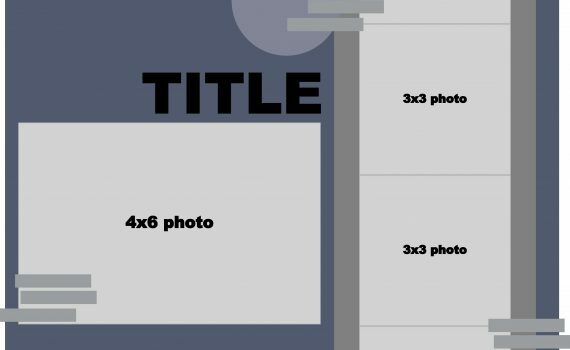 This template is for a 1-page layout, giving you room for 5 photos (3 - 3"x3" and 1 - 4"x6")and a title. There is also plenty of space to add journaling and some fun embellishments. 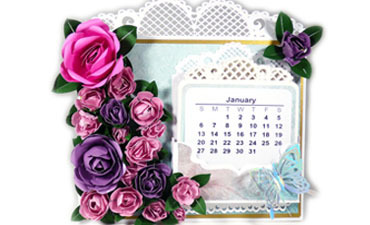 This is a beautiful calendar that is more than just a gorgeous piece of home décor. 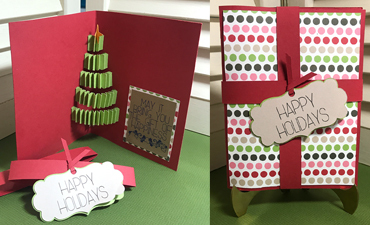 Featuring an easel design so that it stands alone and a pocket for 12 reusable cards, you will want to use this year after year! 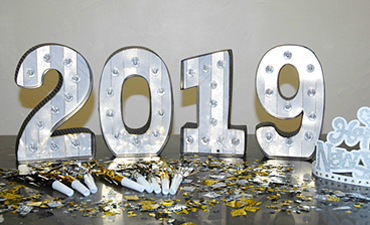 This new year's marquee with working lights will be the perfect centerpiece for your New Year's celebrations! More numbers available so you can use this for any occasion or year! 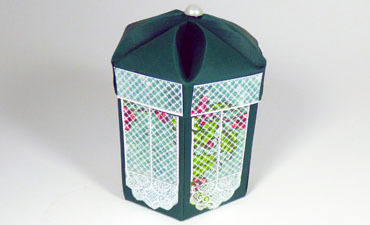 This beautiful six-sided box has a petal dimensional top for a beautiful presentation of a small gift. 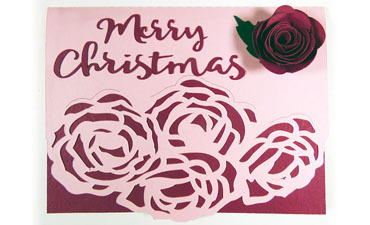 Lovely roses embellish the edge of this Christmas card. 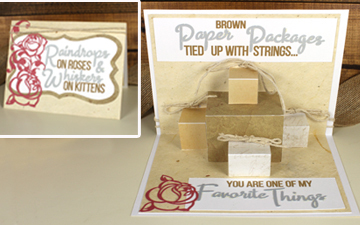 This is a quick card to make, and it will be loved by its recipient! Get in the spirit of the season with this beautiful water shaker card. 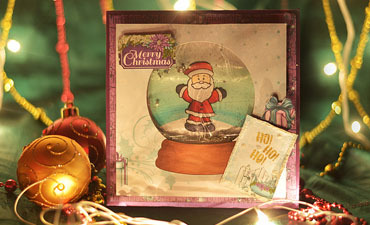 This card uses a Ziploc bag and water to recreate the look of a real snow globe! These delightful pine trees are the perfect addition to your Christmas village, the Pazzles Gingerbread Village, or Pazzles Train Express. 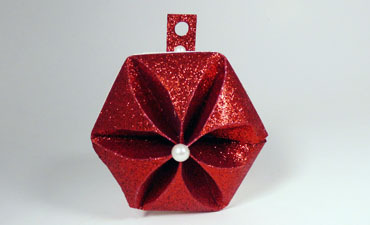 A lovely 3D ornament cut from glitter paper for the holidays. Add a hanger to place on a tree, a banner, or around your home. Light up your home with these beautiful lighted marquees. 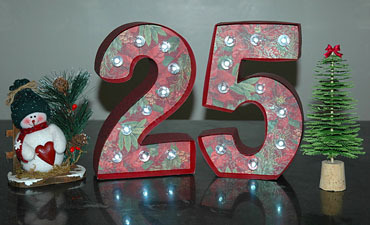 Use these numbers for Christmas or for all different types of occasions such as birthdays and anniversaries. 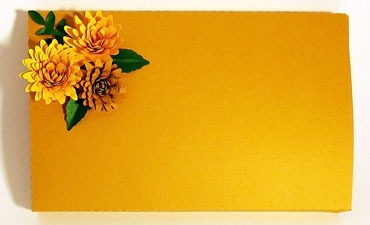 If you need a quick and easy card to make, the elegance of this one is a great choice for this season. 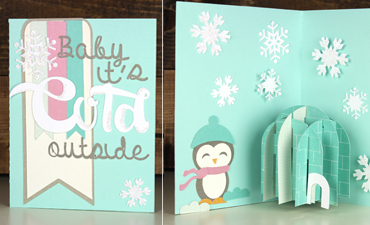 Snowflakes enhance the edge of the card, while snowflakes in a contrasting color provide some dimension. Santa is on his way but he wouldn't get very far without his trusty reindeer! 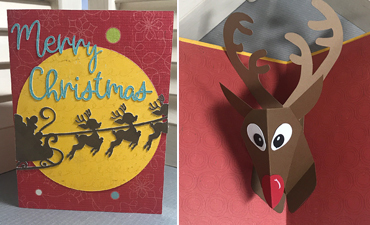 Open up this Christmas card and say hey to Rudolph just "popping in" to say hello! Video tutorial included! 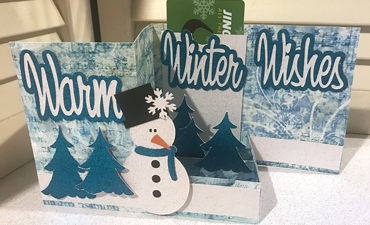 Send warm wishes to someone you care about with this adorable dimensional winter card that opens to reveal a gift card! An amazing pop up scene of Bethlehem that helps us remember the real reason for the season. 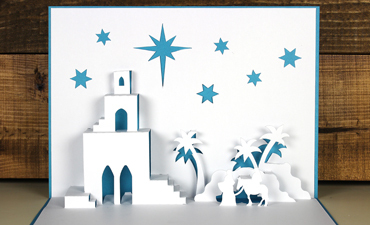 This entire pop-up scene is created out of one single piece of cardstock and is sure to take the recipient's breath away! 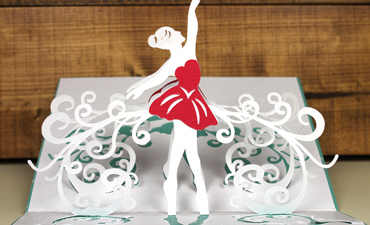 Capture the magic of the Nutcracker with this gorgeous ballerina pop-up card. This card not only is stunning, it is also incredibly easy to assemble. Whether you are piling on the blankets or just wishing for snow, this is the perfect winter card with soft teals and pink, penguin, and a slice-form pop-up igloo! 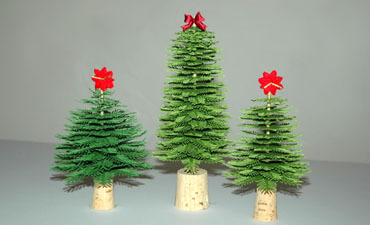 Little rosettes make up this adorable pop out tree in this simply irresistible holiday card. 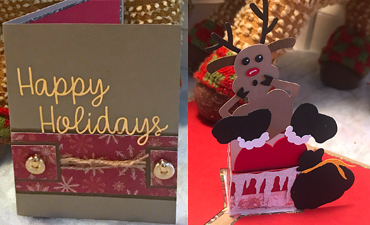 Wrap it all shut with a band and Happy Holidays tag for the perfect card! Video tutorial included! 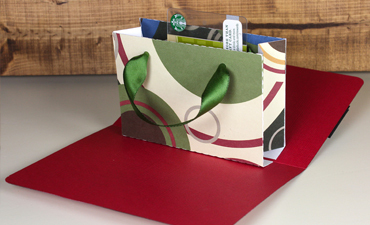 Give a gift card in an extra special way with this unique pop up gift bag. The gift bag pops to life when the card is opened to reveal the gift card in the center of the bag! 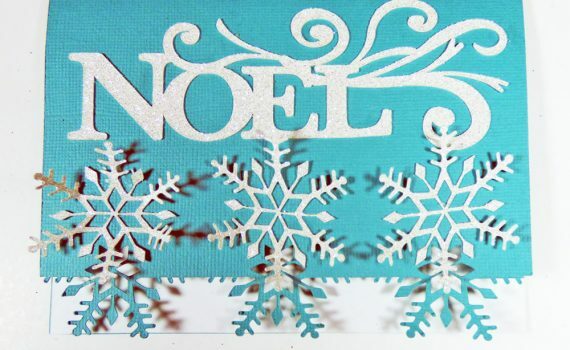 This beautiful Noel card will delight and surprise anyone that receives it. 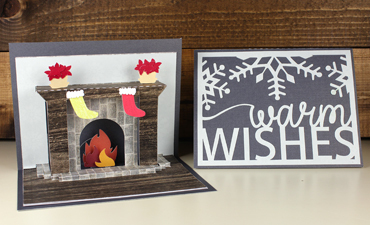 This fireplace pop-up card is a real show-stopper with its own brick pop-up hearth, pop-up fire, wood pillars and mantel, and pop-out poinsettias to top it off! Video tutorial included! Oh no Santa got stuck in a chimney! What will Rudolph do? 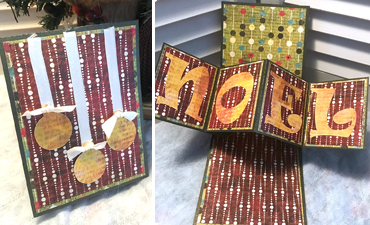 You are going to love this center pop up card complete with video tutorial!